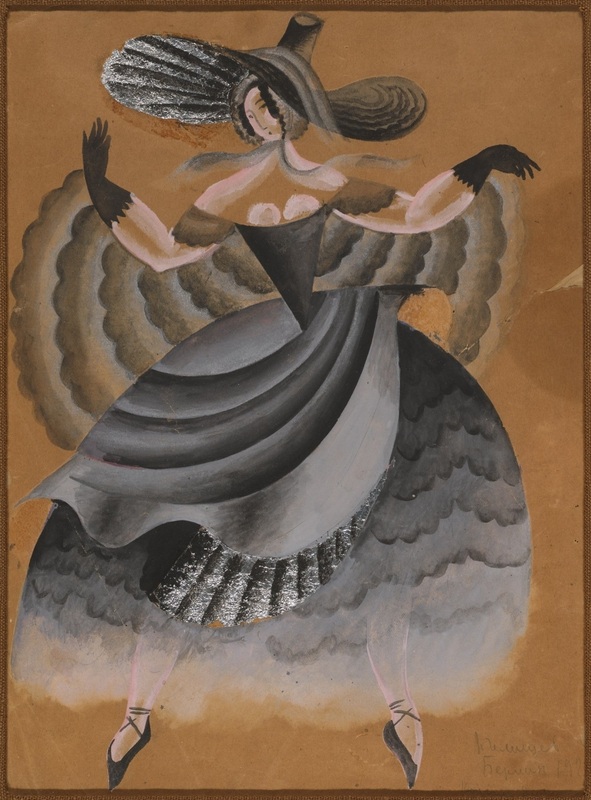 Pencil and pastel drawing on paper by Maurice Charpentier, 1935, for a Serge Diaghilev production. 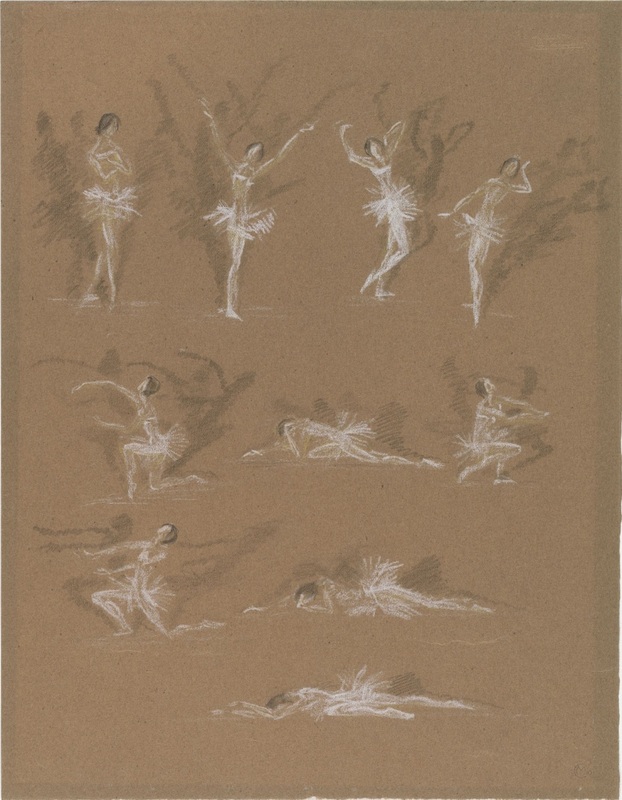 Inkwash on paper sketch by Ethelbert White (undated) for a production that included the dancer, Léonide Massine*. 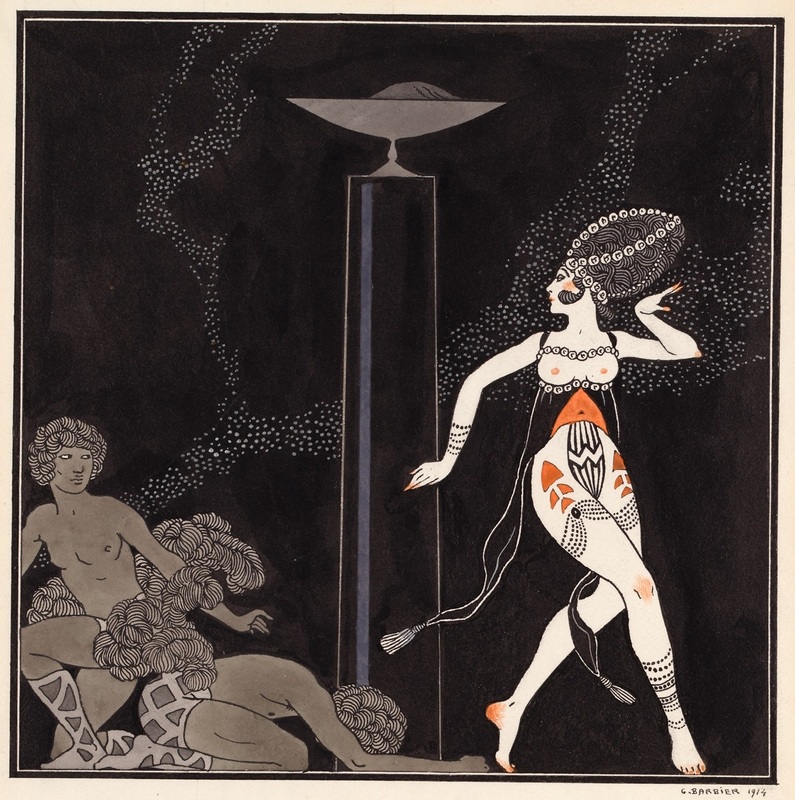 Watercolour on paper sketch by George Barbier, 1914. 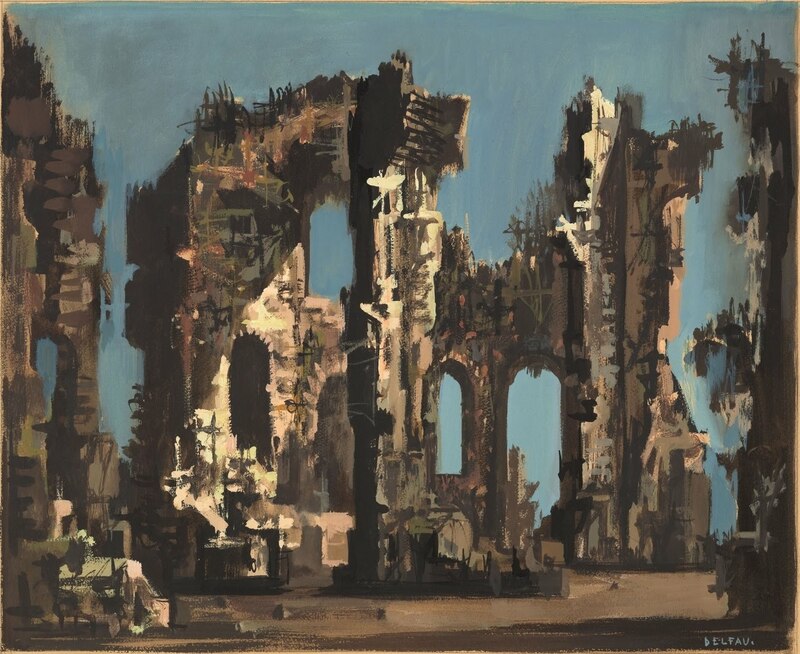 Undated gouache and pencil drawing on pasteboard by Nicolas Remisoff*. 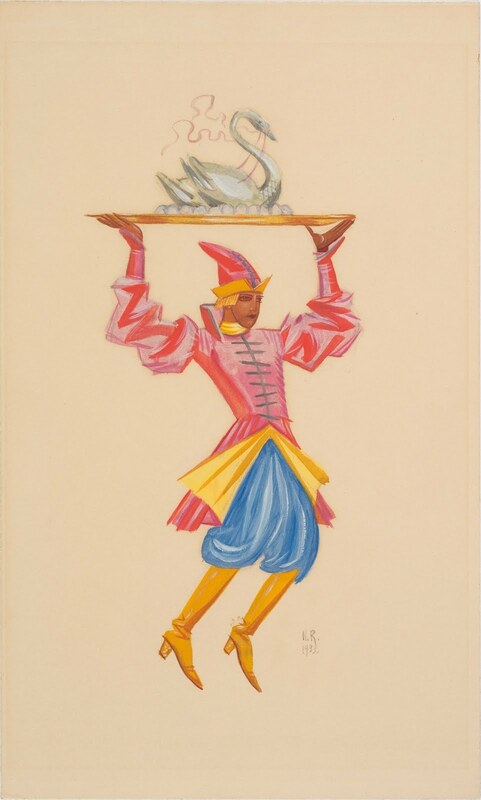 1922 gouache and silver leaf sketch by Pavel Tchelitchev* for a Berlin production. 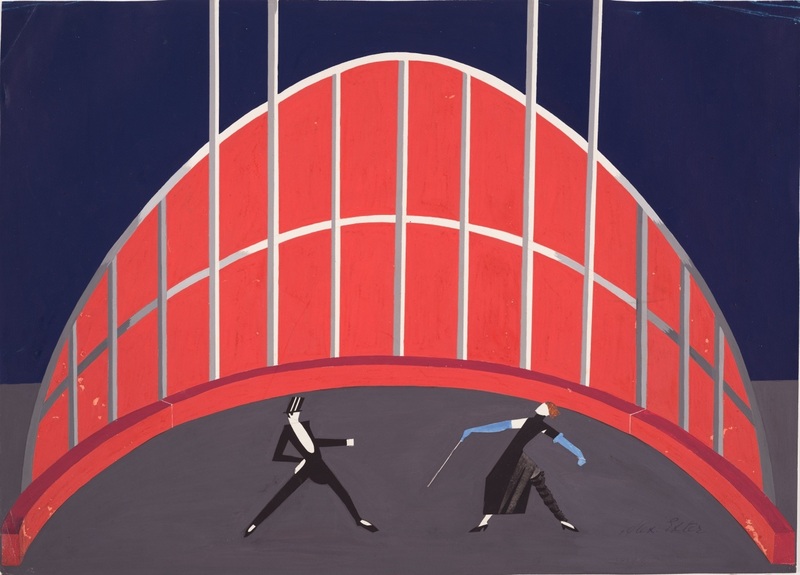 1927 gouache on paper drawing by Alexandra Exter for Le Cirque, a ballet by Elsa Krüger, a dancer and the manager of Berlin’s Russian Theatre. 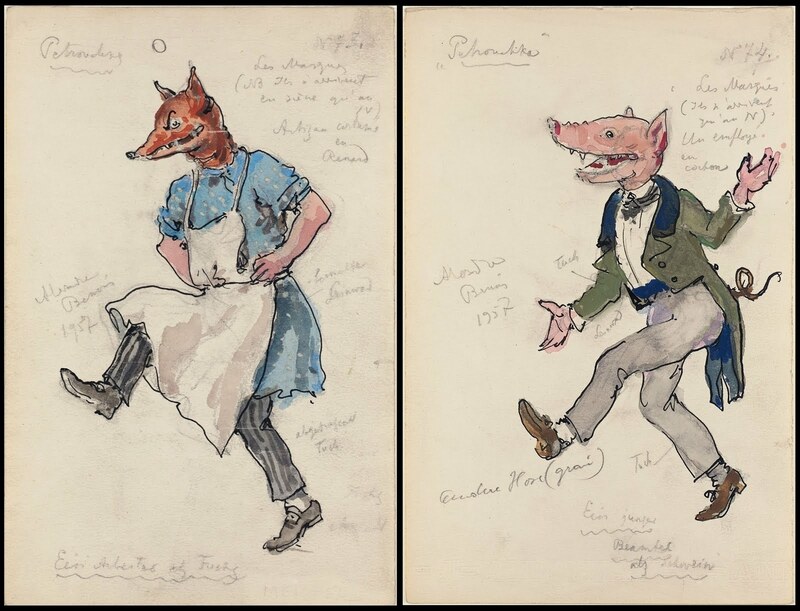 1916 coloured chalk and pencil on paper design by Robert Jones for a ballet about the impudent German folkloric figure, Dyl Ulenspegel*, choreographed by Vaslav Nijinsky*. 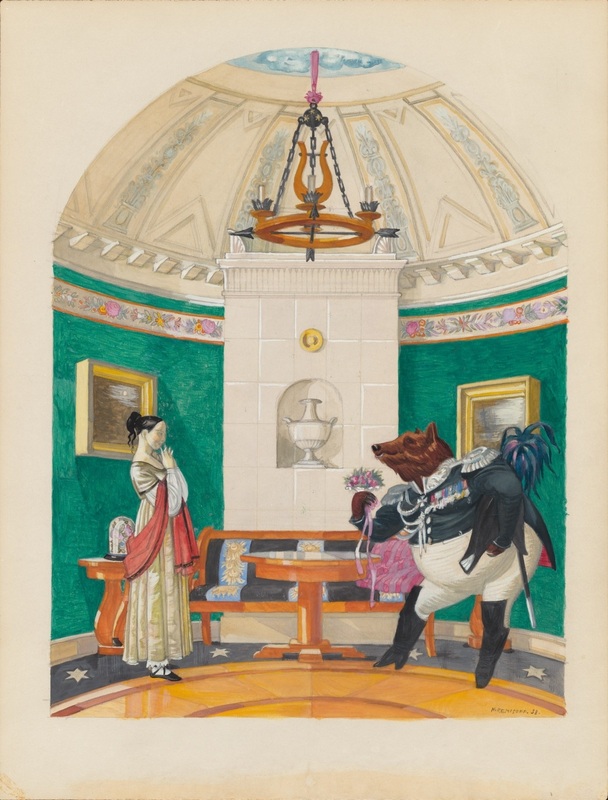 Gouache and pencil on pasteboard sketch by Nicolas Remisoff, possibly for a 1938 production of Beauty and the Beast. 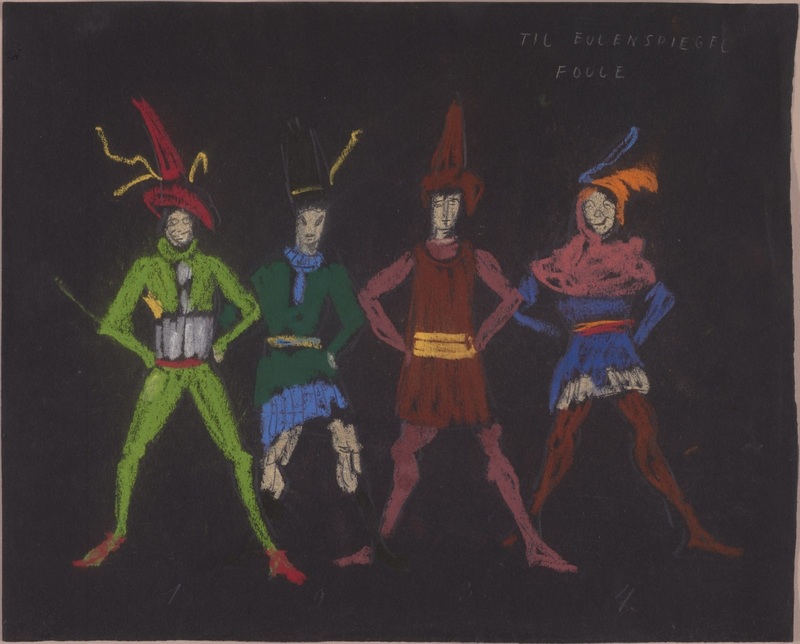 Watercolour, pen and ink and pencil on paper: 1957 design by Alexandre Benois* for the Igor Stravinsky scored production of Petrouchka (Petrushka). 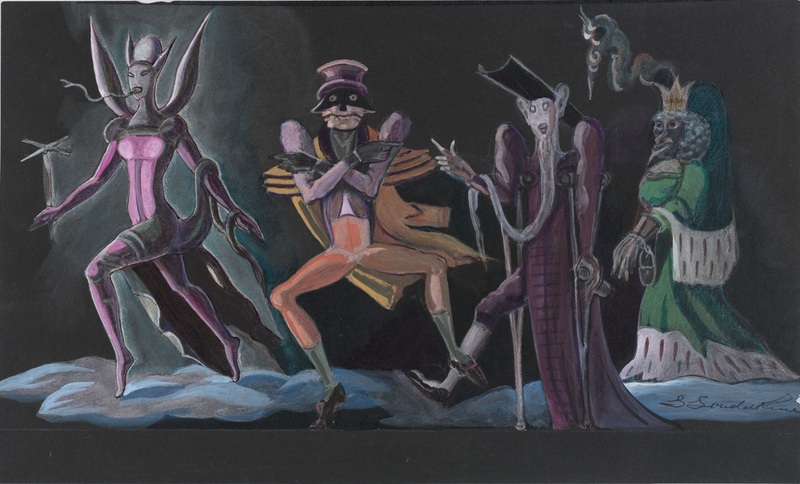 Undated gouache drawing on illustration board by scenery and costume designer, Andre Delfau. 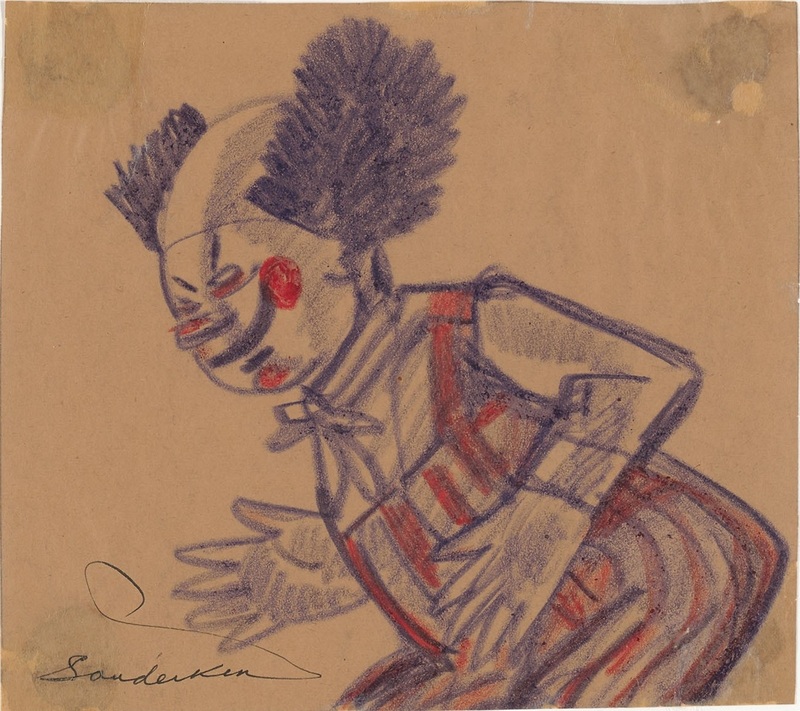 Undated crayon drawing by Serge Soudeikine. 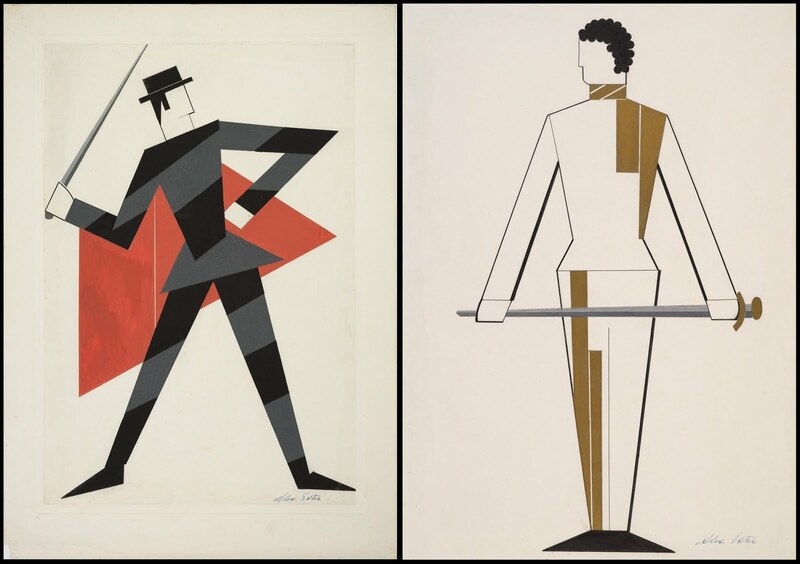 Undated gouache and pencil on paper sketch by Alexandra Exter [or Ekster] (d. 1949), who is described on wikipedia as "a Russian-Ukrainian painter (Cubo-Futurist, Suprematist, Constructivist) and designer." 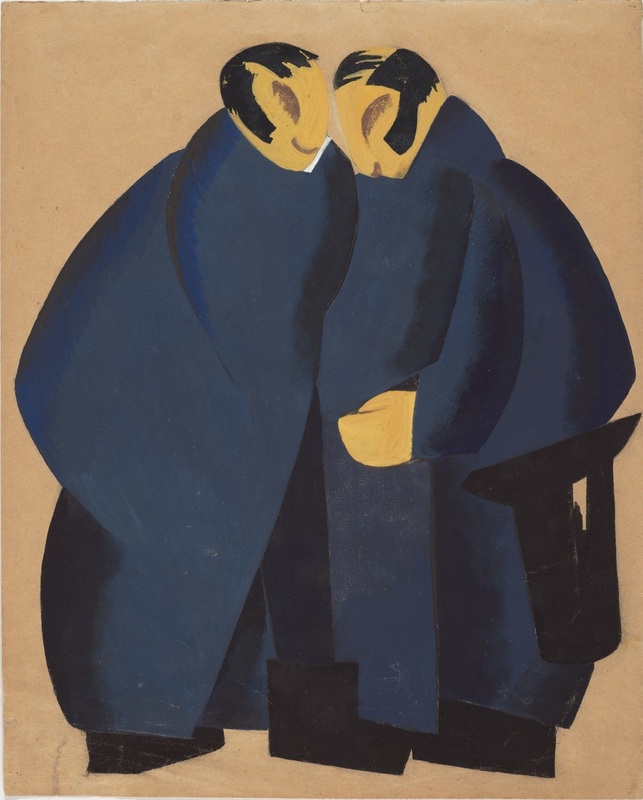 1921 gouache sketch by Alexandra Exter. 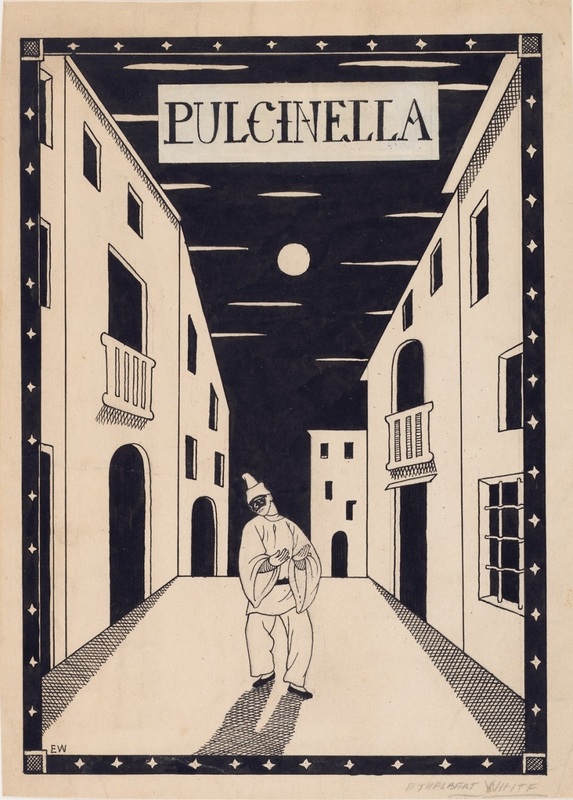 Russian Theatre Designs from the Harvard Theatre Collection - Most of these are associated with productions of Diaghilev's Ballets Russes. Note that there is a thirty minute access timer once you click through so don't -ahem!- save forty URLs expecting to view them later but John informs me that there is a 'bookmark this item' link for each image that I didn't notice. Review of the collection in Harvard Magazine. 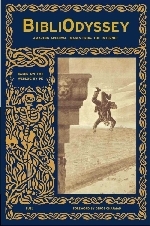 Wikipedia has a reasonable background to the Ballets Russes and a fair sampling of related links. 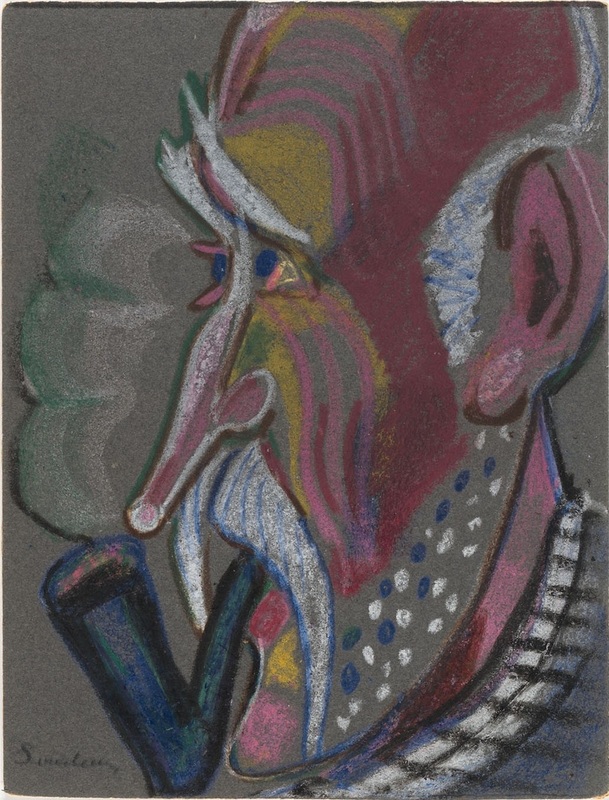 I love the sketchy ghostliness of white pencil on colored paper. These are beautiful, thank you! Thank you so much for posting these--they're a real inspiration. I love the book pages, too. Excellent! I'll have to swipe some. Wonderful post! I almost visited it daily! Best wishes from Romania!